Ivy has lived in a tower, locked away from the rest of the world, for her entire life. Her mother, a witch who leads the resistance against the bloodthirsty kings of the five kingdoms, is her only company. Ivy knows that her battle-weary mother relies on the golden power flowing through her veins for the energy to continue the good fight, but she can’t completely smother the selfish yearning to see the world beyond the safety of their hidden valley. When the demon prince of her mother’s horror stories literally crashes into Ivy’s life, she finds herself facing her wildest dream…and her mother’s worst nightmare. I all but dove into Golden Stair after devouring One Bite. I’ve become quite enamored with Ms. Blackstream’s writing and was eager to begin another Blood Prince tale. This one started a tad slower than I’d have liked but it wasn’t bad, just a little slow. I enjoyed the prologue as usual and was excited to see more of some of the other princes. But the first parts with Ivy and her mother weren’t as interesting to me. But when your heroine is alone in a tower with only her wicked “mother” for the occasional bit of company it’s an understandable slow start. Also, there were a few parallels to Tangled at the start that caught me off guard. However Ms. Blackstream has put her own interesting spin on things once more and made them her own. I wasn’t expecting Ivy’s powers to be what they were much less Adonis’ back story having so many twists and turns. The drama to it all was well done and I appreciated Ms. Blackstream’s unique take on a classic tale. Adonis has stood out in the previous Blood Prince prologues and epilogues as a rakish, snarky man and getting to see more than a glimpse of him was wonderful! While he might be a demon, he isn’t the stereotypical pointy horns and forked tail and full of fire and brimstone demon. There’s a lot of depth to the hero of this tale and I found myself surprised at the man the demon showed us he truly was. It was shocking in the best of ways! And then there was Ivy. Dear, sweet Ivy who has a serious case of Stockholm Syndrome. Ms. Blackstream handled her heroine’s trials and background artfully. She never tried to brush away a lifetime of emotional abuse for Ivy with the “power of true love”. I appreciate a splash of realism in my romance and while a magical world is a far cry from that, the characters that inhabit it have issues and problems shared by real people. All too often you see a damaged character in a romance novel heal their emotional and mental wounds with a single declaration of love or one passionate tryst. Ms. Blackstream stays far away from that and instead her characters cope with their issues in understandable ways. Human ways. I find it much more endearing than the idea true love will vanquish all and I love that she took that route. 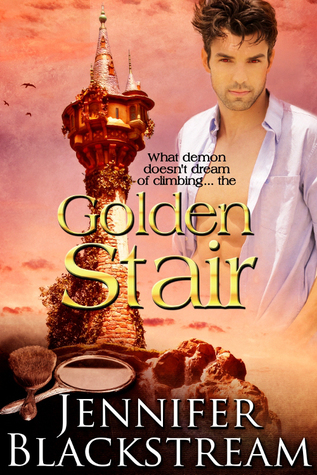 Golden Stair is another interesting take on an old tale and for lovers of paranormal romance with unexpected heroes, I highly recommend it. 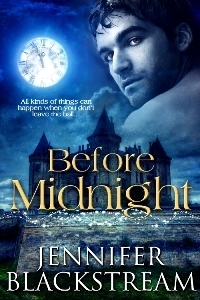 After reading Before Midnight my expectations for the second book in the Blood Prince series were high. Jennifer Blackstream met and then exceeded them! Yet again you were given a peek into the plans laid by a power the princes have no idea is pulling their strings. I’m growing more and more intrigued with each glimpse we’re given. What will the princes do if this outside force is ever made known to them? Considering some of their personalities I think the conclusion of this series will be explosive. Though, honestly, I’m not looking forward to the end; I’ve grown rather fond of the characters Ms. Blackstream has thus far introduced us to. I can only hope that once Blood Prince is over she’ll treat us to future stories involving the princes and their princesses! Those are worries that can be saved for another day! There are still Blood Prince books to read! 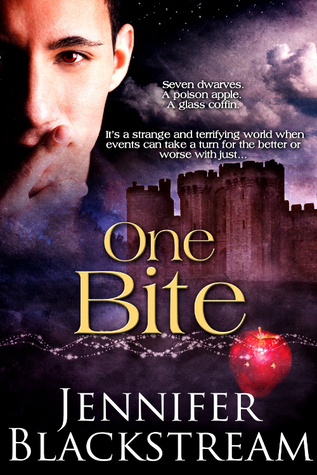 One Bite is a retelling of the Snow White story with another paranormal twist: vampires! The kingdom of Dacia is one full of dark creatures and the royal family are among the darkest of them. I wasn’t expecting the addition of Russian folklore creatures and myths but Ms. Blackstream did a superb job of weaving them into her tale right alongside the Snow White elements. It seemed so natural and worked so well with her setting! 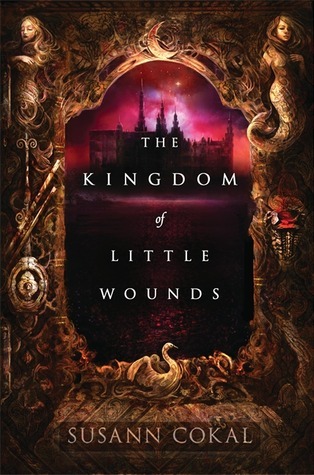 While I liked the kingdom of the first book, Dacia really stuck with me. I’m a fan of darker fantasy with some horror elements to it and Dacia pushed all the right buttons for me in those regards. Along with the vibrant characters, the world made the book come to life for me. Irina, the heroine of the tale, is a strong young woman with noble goals and a kind heart as well as a cunning mind. From the start she held her own and I appreciated her determination and drive. As the book went on and we learned more of her heritage and history I found myself rooting for her more and more. And, considering the prince she sometimes acts in opposition to, that surprised me. Kirill fits many of the archetypes that make me all but fall in love with a character. I have a fondness for schemers and social engineers and Kirill was both. He kept his ambitions in mind throughout the book and only, in a time of great duress, did he consider compromising them. Both he and Irina held onto their goals till the eleventh hour and the conflict it sparked between them was delightful to watch. In the end they found a solution that didn’t compromise them as characters and I love that. All too often you see characters in romance novels becoming a wholly different person to suit the needs of their significant others. To see Irina and Kirill grow to work together and flourish despite their differing views was one of the best parts of One Bite in my mind. I highly recommend this book. As in stop reading this review and go out and get it already! If you love fairy tales steeped in political intrigue this one is for you. I started Before Midnight knowing it was inspired by the story of Cinderella (And looking forward to a retelling of the fairy tale!) so, unlike some other reviewers, it was actually the prologue that caught me off guard. I knew the series was interconnected but the way that Jennifer Blackstream chose to do so has me very intrigued. From the first sentence I was surprised – in a very good way – and the initial intrigue had me devouring the book itself. And Cinderella meets werewolves? Sounds like a delicious combination to me! The story of Loupe and Etienne shares some of the themes of the original Cinderella and while I feel like it could have been fine without them, I loved the idea of the ball and the twist Ms. Blackstream put on the slipper. I thought it was a very creative idea and retelling that was never predictable! The characters she created are intriguing (I am itching to know more about the other princes in the prologue!) and both Etienne and Loupe were dynamic in their own ways. You might argue that Loupe was timid and weak but I felt that the growth and development for her was logical and made sense considering her upbringing and history. She is a kind woman and what can I say, I’m a sucker for puppies and her empathy for them had me smiling. And a handsome prince playing with cute little animals? Extra points for the adorable! On the subject of Etienne, he was a very interesting prince; I have a weakness for werewolves and Ms. Blackstream put a very fun spin on them with her first prince! His dual nature and his struggle to handle his emotions as a human left me wanting to know more of him. My only gripes are that it wasn’t long enough which, in several parts, made it feel a little rushed. I wanted more of them both and more background to it all. Some of the scenes and some of the characters would have, in my opinion, benefited from more time on the page. Loupe’s stepmother had me wondering; I’d have liked to know just how she and Loupe’s father ended up together or more of where she comes from. My hope is that as the series builds we might have some answers to questions I’m left pondering. Overall though it was a great read. A fun story with characters that interested me and left me hoping to see them again – even if only in brief snippets in later books. I recommend it; it was worth the read!